C. straminca var. moniliformis Tuckerm. Enum. Meth. 17. 1843. Not C. scoparia var. moniliformis Tuckerm. 1843. Carex foenea var. 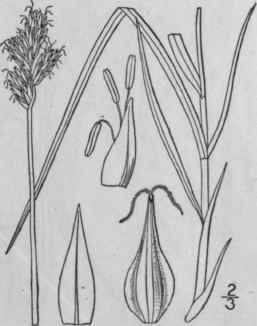 sabulonum A. Gray, Man. Ed. 5, 580. 1867. Not C. sabulosa Turcz. 1837. 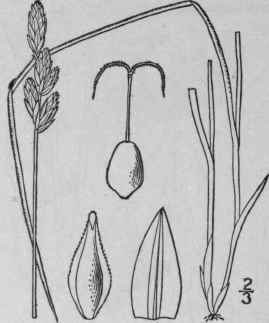 Carex silicea Olney, Proc. Am. Acad. 7: 393. 1868. Culms slender, rather stiff, erect but the summit recurved or nodding, slightly roughish above, 1°-3° tall. Leaves 1"-2" wide, involute in drying, shorter than the culm; bracts scale-like; rpikes 3-8, or rarely more, ovoid-conic or ovoid-oblong, silvery-green, nearly white or in age becoming brownish, erect, conspicuously clavate and stami-nate at the base, 3"_ 10 "long, 2"-3 1/2 thick, all separated or the uppermost close together, forming a flexuous monili-form head 11 /2- 3 1/2' long; perigynia with oval or obovate body, firm, short-beaked, nerved on both faces, wing-margined, closely appressed, 2"-2 1/2" long, 1 1/4"-1 1/2" wide, longer and much broader than the lanceolate acute scales; stigmas 2. In sands of the sea coast, Newfoundland to Virginia. June-Aug.
Carex leporina L. Sp. PI. 973. 1753. C. oralis Gooden. Trans. Linn. Soc. 2: 148. 1794. Culms slender, erect, stiff, roughish above, 6'- 11/2° tall, caespitose. 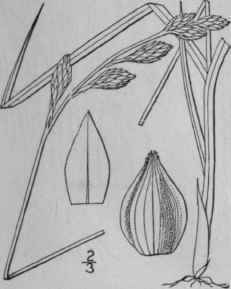 Leaves i"-i 1/2" wide, flat, shorter than the culm, not bunched at base; bracts very short and scalelike or wanting; spikes 3-7, ovoid or elliptic, blunt at the summit, rounded and staminate at the base, 3 1/2";7" long, 2 1/2"-4" thick, many-flowered, dark brown, shining, clustered but distinct, in a terminal oblong head; perigynia appressed-ascending, ovate, 2" long, nearly 1" wide, rather narrowly wing-margined, several-nerved on outer face, nerveless or lightly nerved on inner, the rough tapering 2-toothed beak nearly as long as the body; scales lanceolate, brown, with narrow hyaline margin, acute, about as wide and as long as the perigynia; stigmas 2. In dry places, Newfoundland to Massachusetts and New York. In ballast southward. Europe and Asia. June-Aug.
C. xerantica Bailey, Coult. Bot. Gaz„ 17: 151. 1892. C. foenea var. xerantica Kukenthal, Pflanzenreich 38: 205. 1909. Culms caespitose, stiff, 1°-2° tall, strictly erect, smooth or little roughened above. Leaves 1"- 11/2" wide, somewhat involute in drying, clustered toward the base, shorter than the culm; spikes 3-6, ellipsoid, densely many-flowered, close together or the lower slightly separated, 4"-7" long, 2i" in diameter, tapering at base, the staminate flowers basal; bracts scalelike; perigynia lanceolate-ovate, pale, 2"-2|" long, 1"- 11/4" wide, closely appressed, nerveless or nearly so on inner face, bright yellow at base, wing-margined, the rough tapering beak shorter than the body; scales with broad, silvery white margins and darker center, acute, equalling or a trifle longer than the perigynia and rather wider; stigmas 2. Prairies, western Manitoba to Athabasca and Kansas. May-July.